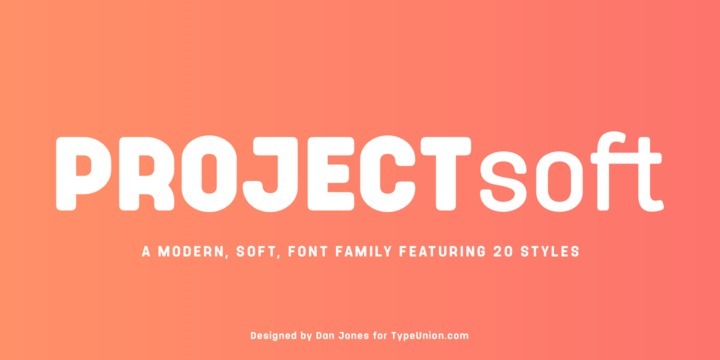 Project Soft is an improved version of Project Sans typeface created by Dan Jones and published by TypeUnion which is available in 10 weights (from Thin to Heavy) with accompanying italics, a wide range of OpenType features and multilingual support. In front of Project Sans, Project Soft is more friendly. This modern font it is suitable for branding, advertising, magazine, packaging, poster, web etc. Enjoy! A font description published on Friday, February 9th, 2018 in Dan Jones, Fonts, TypeUnion by Alexandra that has 1,839 views.